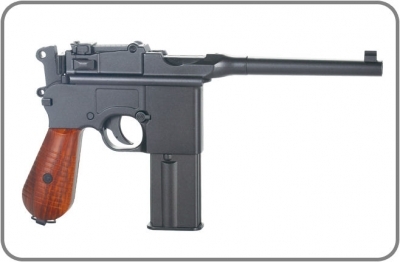 The Mauser C96 is a semi-automatic pistol that was originally produced by German arms manufacturer Mauser from 1896 to 1937. Unlicensed copies of the gun were also manufactured in Spain and China in the first half of the 20th century. As a military sidearm, the pistols saw service in various colonial wars, as well as World War I, The Easter Rising, the Estonian War of Independence, the Spanish Civil War, the Chinese Civil War and World War II. The C96 also became a staple of Bolshevik Commissars and various warlords and gang leaders in the Russian Civil War, known simply as "the Mauser". Winston Churchill was fond of the Mauser C96 and used one at the 1898 Battle of Omdurman and during the Second Boer War; Lawrence of Arabia carried a Mauser C96 for a period, during his time in the Middle East. Indian Revolutionary Ram Prasad Bismil and his partymen used these Mauser Pistols in the historic Kakori train robbery in August 1925. Chinese Communist General Zhu De carried a Mauser C96 during his Nanchang Uprising and later conflicts. 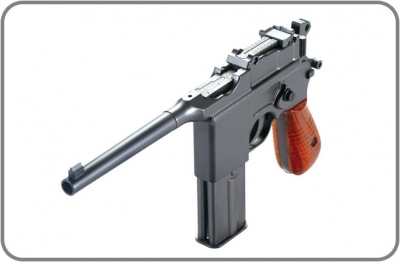 The Broomhandle Mauser is a popular collector's gun. It was popularized in Soviet films as the iconic weapon of the Russian revolution and civil war. The C96 frequently appears as a "foreign" or "exotic" pistol in a number of films (such as The Great Silence, where Jean-Louis Trintignant's use of the C96 intentionally contrasts with the Colt Single Action Army revolvers used by the other characters in the film) and TV shows, owing to its distinctive and instantly recognisable shape. Author Ian Fleming outfitted agents of SMERSH in the James Bond series with Mausers on the advice of firearms expert Geoffrey Boothroyd. 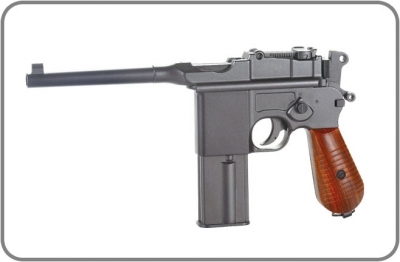 A C96 was modified to form Han Solo's prop blaster pistol for the Star Wars films. Reproductions of the blaster became so popular in the Cosplay community that gun collectors became aware that fans were buying and altering increasingly rare original Mausers to make blaster replicas. the Mauser c96 was also carried by Timothy Dalton's character Sir Malcolm Murray in the Showtime series Penny Dreadful. Full metal barrel, frame, sights, hammer, magazine and charging handle. Plastic wood effect pistol grip.